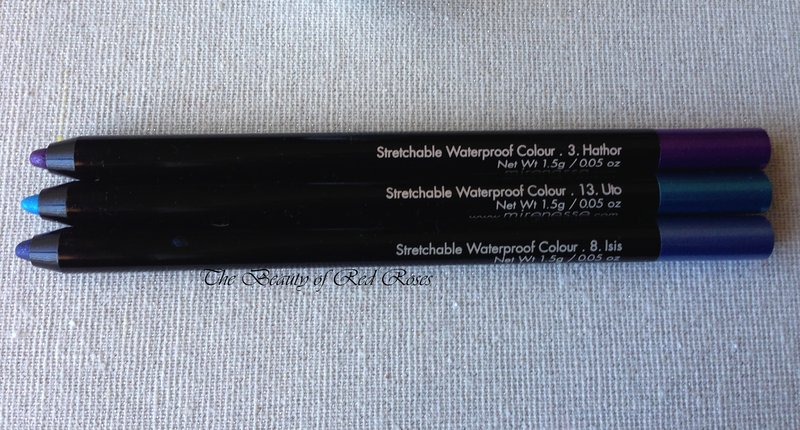 I have finally found the best set of eye kohl pencils that suit my oily lids! 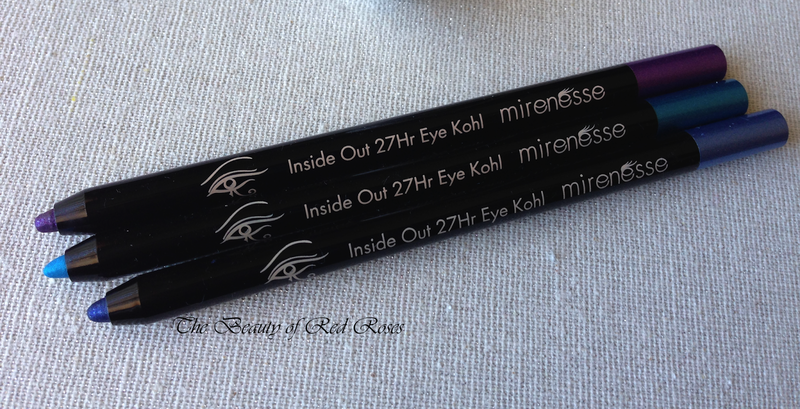 I've been trialling the Mirenesse Inside Out 27Hr Eye Kohl Jewels (A$39/1.5g) and these are the BOMBDIGGITY! Mirenesse named their eye kohl pencils as ‘Inside Out’, because you can apply the eye kohl along the inner and outer corners of the eye. One of the best features of these eye kohl pencils is that they can be used as an eye shadow and eyeliner and they are incredibly long-wearing! Mirenesse Inside Out 27Hr Eye Kohl Jewels are formulated from crushed pearls, glossy mineral pigments and organic plant waxes; and are free from fragrance, petrolatum, mineral oil, parabens, alcohol/talc. Hathor - a vibrant purple shade with subtle purple and silver shimmer. Uto - a super bright aquamarine blue with a metallic sheen. Isis - a dark navy blue with beautiful blue and silver shimmer. 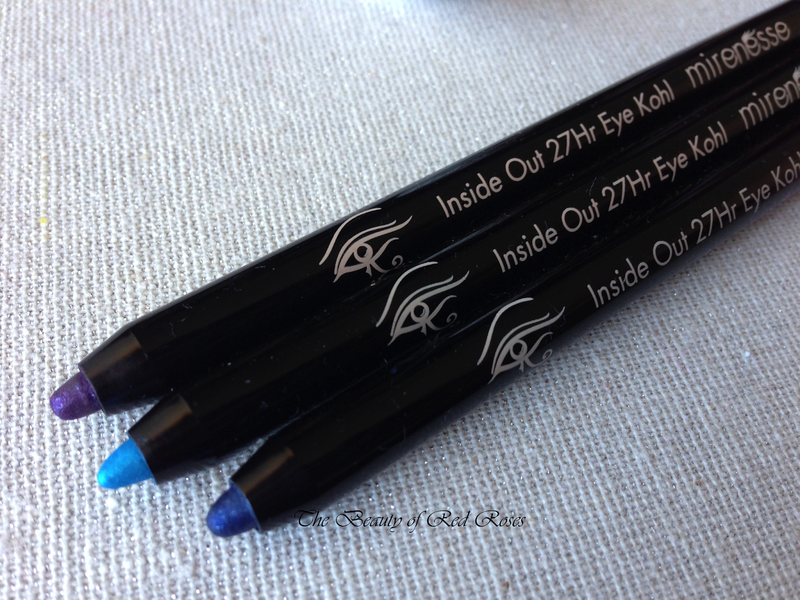 These eye kohl pencils are richly pigmented and deliver a blast of colour and definition to the eyes. The formula is waterproof and buildable, so you could attain a beautiful bold intensity using 2 to 3 swipes! The pigmentation is highly intense that the formula does not fade, transfer nor budge at all! These eye kohl pencils do not give racoon eyes, which is a huge plus! The longevity of the eye kohl claims to stay put for up to 27 hours and the longest time I've worn these eye kohl was 10 hours and my eyes still looked beautiful, bold and fresh. The creamy and dreamy formula glides on relatively smoothly for the shade Uto and slightly more gritty for the shimmery shades Hathor and Isis. Due to their somewhat soft texture the tiny tip of the eye kohl pencils do tend to become blunt easily with regular use. Since these eye kohl formulas set so quickly, I’ve had to use a brush to quickly soften and blend the colour to create a subtle smoky eye look. The colours are easily blendable before they start to set, so you could create a multitude of different eye looks. The eye kohl pencils, which contain shimmer are not so ideal for tightlining and waterlining as the shimmers could irritate the eyes, however, the shade Uto would be fine for doing so. 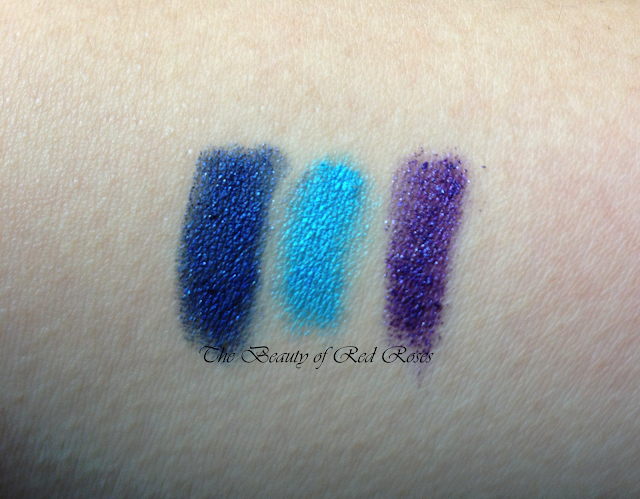 Swatches of Mirenesse Inside Out 27Hr Eye Kohl Jewels. L-R: Isis, Uto and Hathor. To remove the eye kohl from my eyes I’ve had to use a really good eye makeup remover as the formula is waterproof and does not wipe off so easily with water. I use Neutrogena Gentle Eye Makeup Remover (reviewed here), because the solution is gentle to my skin and works effectively to remove all traces of eye makeup. Do you prefer eye kohl pencils or eye shadows? Have you tried Mirenesse Inside Out 27Hr Eye Kohl pencils before? Which shades do you love most? Products were provided for consideration only. This review is 100% based on my own thoughts and opinions. I am not affiliated with Mirenesse and did not receive remuneration to post this product review. These look so pretty! I love how vibrant and pigmented the shades are. I havent try a lot of Mirenesse products but I'll be keeping an eye out for when these are on sale!